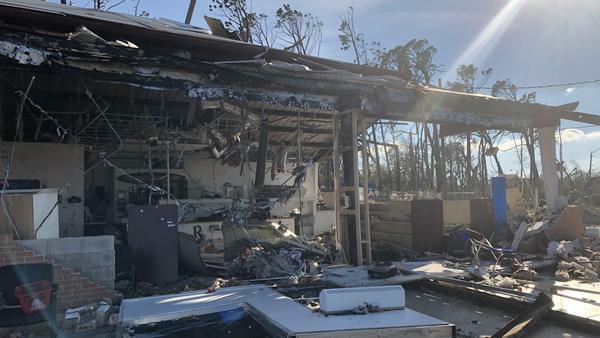 The walls and windows of this pharmacy in Lynn Haven, Fla., were blown out during Hurricane Michael, but pill bottles remained lined up on the shelves. 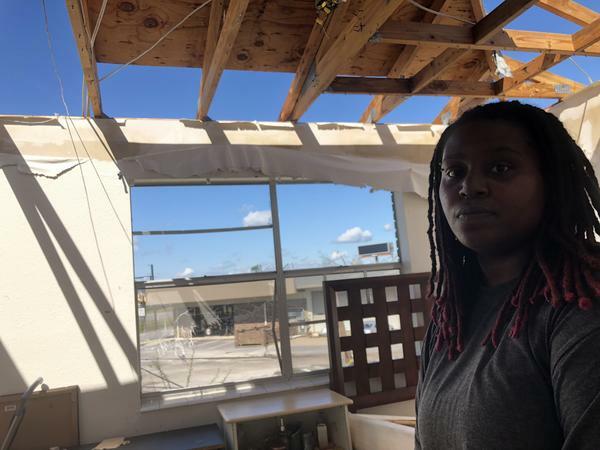 The city saw widespread damage from Hurricane Michael, including roofs blown off and fallen trees. Anjaleesa Douglas can now see daylight from her bedroom. Only two pieces of plywood are still attached to the roof truss. Most of the roads in Florida's Bay County are now impassable. There's no electricity, no working sewers, no gasoline, very little cell service, and a boil water advisory. "This whole town's destroyed" after Hurricane Michael, says Ryan Smith, a mechanic in Lynn Haven, on the north side of Panama City, Fla. He's standing outside a red brick apartment complex where most of the roofs are gone and giant pine trees have fallen through some of the buildings. "This was our house," he says. "Now all our stuff's destroyed." Smith's stepfather is sweeping roof shingles from the sidewalk as Smith passes out orange juice and bananas to the neighbors. Some of the tenants here have disabilities, and others couldn't afford to heed the county's evacuation order. Smith's reason: "We didn't have gas. Everybody took the damn gas." When he couldn't fill up his pickup truck, Smith built a bunker under his steps using mattresses — he stocked it with food, water and toys for the six children younger than 5 who sheltered there with his mother and wife. He thought it was going to hold until the roof blew open. "My stepdad — the big dude right there — he's holding the door shut trying to get the air to not come up and rip the roof off," he remembers. "And it's sucking him in the door. And I'm downstairs trying to hold the mattresses over the back windows so frickin' shards of glass ain't flying in and cutting everybody up." Search and rescue teams will try again Friday to get into neighborhoods like Lynn Haven devastated by Hurricane Michael. It's been a slow process hampered by heavily damaged infrastructure. But until official help can arrive, neighbors are turning to one another for support. As the eye of the storm passed over, Smith rushed to help neighbors. One of them was Audrianna Peterson. "We kept hearing the pressure in our ears," she says. "Next thing you know we had a glass bust open and the pressure was so deep we couldn't open our door. We called him. We called Ryan to come. We was calling and screaming for Ryan because we thought we were going to die. If it wasn't for him we would be dead right now." Peterson was with Anjaleesa Douglas, who shows me what's left of the apartment. "The roof went down first right here. I mean, it was horrible." She leads me upstairs, where you can look up and see daylight. Her room is at the top of the stairs — the sun shining on a soggy upended mattress. Only two pieces of plywood are still attached to the roof truss. "It was just really an eye-opener," she says. "When they say leave, leave. I will never do this again in my life ever. I will never do this again. I almost lost my life." Peterson and Douglas are planning to go stay with friends in Pensacola for now. Smith's mother, Michelle Horak, says she's getting her family out, too. Relatives who live in another town are coming with gas to help them leave. "And then I don't know what we're going to do after that," she says. "I don't know. I guess life as we know it has changed." As the initial shock of Hurricane Michael wears off, the uncertainty of what the future holds sets in. In Bay County, Fla., search and rescue teams will try again today to get into neighborhoods that were devastated by Hurricane Michael. It's been slow going. The infrastructure is badly damaged. And so until official help can arrive, neighbors are turning to one another for support. NPR's Debbie Elliott has that story. DEBBIE ELLIOTT, BYLINE: Most of the roads are impassable. And there's no electricity, no sewer, no gasoline, very little cell service and a boil water advisory in Bay County. RYAN SMITH: This whole town's destroyed. ELLIOTT: Ryan Smith is a mechanic in Lynn Haven on the north side of Panama City. He's standing outside a red brick apartment complex, where most of the roofs are gone and giant pine trees have fallen through some of the buildings. SMITH: This was our house. Now, all of our stuff's destroyed. SMITH: Because we didn't have gas. Everybody took the damn gas. ELLIOTT: When he couldn't fill up his pickup truck, Smith built a bunker under his steps using mattresses. He stocked it with food and water and toys for the six children under 5 who sheltered there with his mother and wife. He thought it was going to hold until the roof blew open. SMITH: My stepdad over there, the big dude right there, he's holding the door shut trying to get the air to not come up and rip the roof off. And it's sucking him in the door. And I'm downstairs trying to hold the mattresses over the back window so the frigging shards of glass ain't flying in and cutting everybody up. ELLIOTT: As the eye of the storm passed over, Smith rushed to help neighbors. One of them was Audrianna Peterson. AUDRIANNA PETERSON: We kept hearing a pressure in our ears on the roof. Next thing you know, we had a glass bust open. And the pressure was so deep, we couldn't open our door. We called him. We called Ryan to come. We was calling and screaming for Ryan because we thought we was going to die. Like, if it wasn't for him, we would be dead right now. ELLIOTT: Peterson was with Anjaleesa Douglas, who shows me what's left of the apartment. ELLIOTT: We're right here when you walk in the door. We're going up the stairs. ELLIOTT: And you can see daylight above us. ELLIOTT: Her room is at the top of the stairs. The sun is shining on a soggy, upended mattress. Only two pieces of plywood are still attached to the roof truss. DOUGLAS: It just really was an eye-opener, you know? When they say leave, leave 'cause I will never do this again in my life, ever. I will never do this again. This - almost lost my life. ELLIOTT: Peterson and Douglas are planning to go stay with friends in Pensacola for now. Ryan Smith's mother, Michaelle Horak (ph), says she's getting her family out, too. Relatives who live in another town are coming with gas to help them leave. MICHAELLE HORAK: Then I don't know what we're going to do after that. I really don't know. I guess life as we know it has changed. ELLIOTT: As the initial shock of Hurricane Michael wears off, the uncertainty of what the future holds sets in. Debbie Elliott, NPR News, Lynn Haven, Fla. Transcript provided by NPR, Copyright NPR.